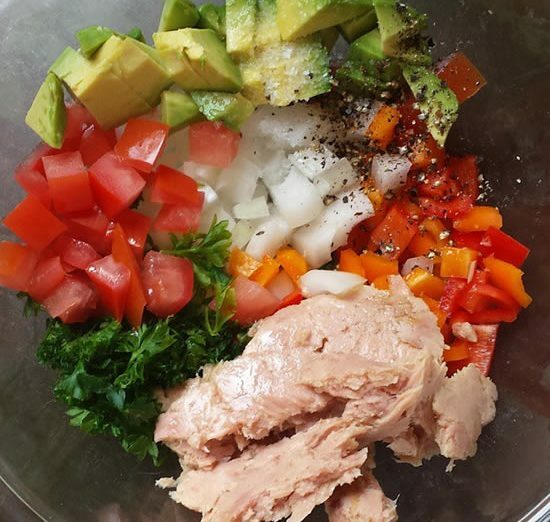 Tuna salad variations | Tuna salad variations – oh, that's tasty! Making healthy food more convenient is the way to kick the convenience food habit! But I can’t deal with the kind of meal prep that requires having 12 different casseroles in the freezer to drop in the slow cooker. What works for me is having a lot of different ingredients and meal components chopped and/or cooked, so they’re ready to be thrown together at a moment’s notice, for quick, easy meals — not just dinner, but also super easy lunches, since I work from home. Lately, I’ve been on a tuna salad kick. It’s a perfect lunch for summer – no cooking needed! 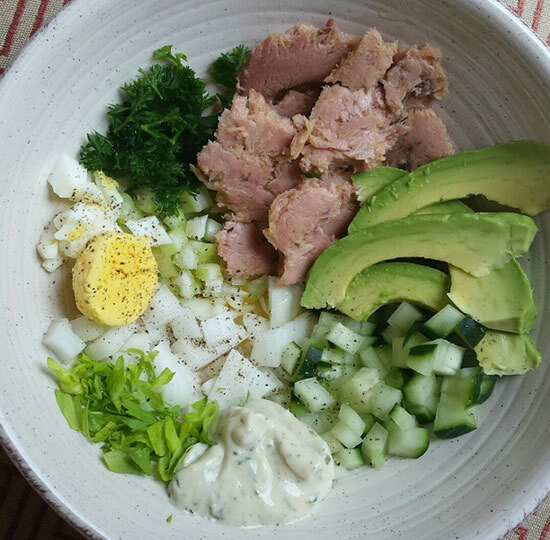 I do sometimes do the super-simple version of throwing a packet of tuna, a bit of homemade mayo, and some lemon pepper together and eating it on romaine hearts. Might even throw in some chopped celery and/or pickle, if I feel like a little something extra. But lately, I’ve been doing variations on a tuna salad dressed with oil and vinegar, rather than mayo. And this is a great way to work in lots of veggies, too! This would work great for a lunch to pack for work, school, or a picnic, too. This is where my meal prep comes in handy. I always keep a container of already-diced yellow onion in the fridge, and a container of already-chopped parsley in the freezer. I squeeze fresh lemons every few days and keep a bottle of that in the fridge. If you’re cool with the pre-squeezed stuff that comes in a bottle, I won’t judge! I also keep tuna packets in the fridge, so the tuna is already cold when I add it to the other salad stuff. When I buy a bunch of parsley, I chop it all and put it in a baggie in the fridge. It stays a nice green and is super easy to grab what you need and toss it into any dish. Avocado is something that’s best cut up at the last minute, but thanks to the acid in the dressing, the avocado won’t turn too brown if you need to hold this for a few hours. Then add the other veggies of your choice, and stir it all together gently. It’s best if you can let it chill for a couple hours or so, but I rarely think ahead that far! Whenever you’re ready to eat it, taste it first and adjust the seasoning if necessary. Add more salt if it’s just overall bland; more lemon/vinegar and/or pepper if it needs more zing! This has been my standby combo for years: to the basic core recipe, I add some chopped bell pepper — also something I keep ready in the fridge — and some chopped tomato. (Tomatoes should always be kept at room temp for best flavor, so those can’t be stashed in the fridge.) Measurements aren’t important; just add it till it looks like an amount you’ll like. Lately, I’ve been trying to live without nightshades — a family of plants including potatoes, tomatoes, and all peppers except black pepper. (Not because these veggies are bad for you! But some people have a sensitivity to them, and I’m experimenting to see if they have any impact on how I feel.) 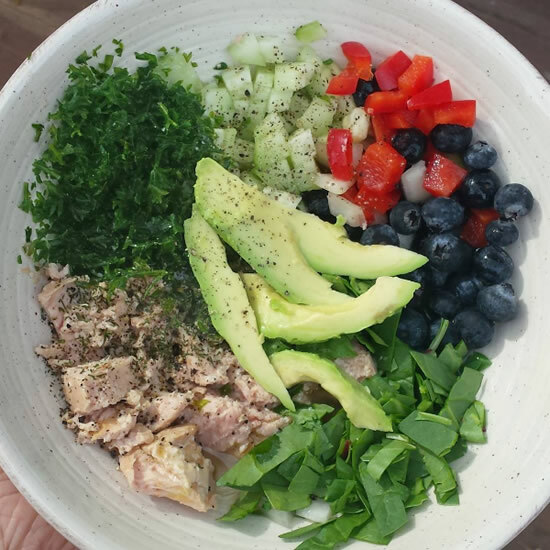 So here are a few nightshade-free tuna salad variations. Here, I used diced cucumber to replace the crispy texture of the bell pepper, and pine nuts to fill the role of the sweetness of the tomatoes. It turned out quite nice! And here’s another slight variation on that: still with cucumbers, but I’ve also got some diced celery, chopped celery leaves, and homemade paleo Ranch dressing added to the mix. Oh, and half a hard-boiled egg — another thing to keep on hand, if you like them. Another alternative for those avoiding tomatoes: blueberries! I know, it sounds weird, right? But don’t knock it till you’ve tried it! The blubes have a sweet-slightly-tart flavor that makes an excellent sub for tomatoes. Pretty easy lunches, huh? 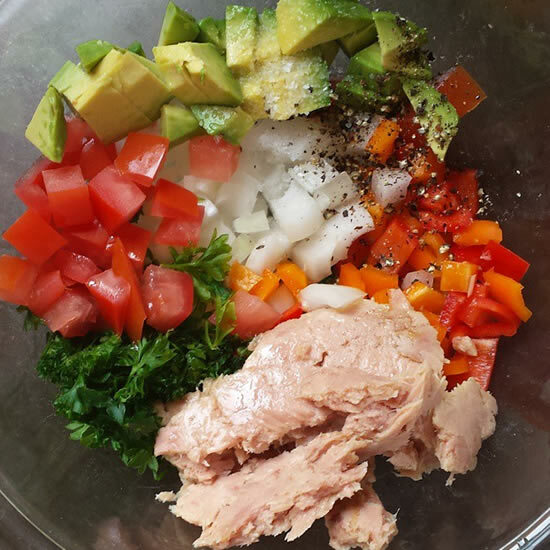 I hope this gives you some inspiration: with some of your favorite pre-diced veggies in your fridge and a couple other staples on hand, you can mix up any number of variations of your own favorite salad, and it really just takes a few minutes. These could serve two people for a light lunch; especially if you serve something else with it. I must confess, though, that most days, I polish it all off on my own! Great idea, I been trying to think of how to get my tuna salad creamy without mayo or yogurt. Avocado and olive oil is perfect, easy and healthy. My hubby doesn’t care for healthy, he still like the miracle whip, sweet relish add-ons between sliced bread but I prefer the avocado, think two batches would be great, one for him, one for me. My only variation would be to spread my tuna batch on high fiber tortilla sheets to get my huge starter dose of fiber. Great job, great idea! Thanks for this. Thanks – glad you like it! Have you tried making homemade mayo? I put it off for so long, thinking it would be hard. It’s not! Every once in a while you have a batch that won’t emulsify, but usually it works like magic. I’ve got a recipe here. Yay — glad you like it! How many servings is this? With 3T olive oil and the avocado alone this would be 550 calories without the tuna. One or two servings, depending on your appetite, your weight, and whether you worked out today. But even though I’m small (5’5″), I usually eat the whole thing myself! I don’t count calories any more. When I stick to whole foods, stay away from foods that trigger excess, and keep my carbs and protein in balance, I can maintain my healthy weight range without counting anything. This salad is full of nutrient-dense, good-for-you whole foods! I just say wow! It is perfect recipe for me. I and my hubby have over weight .So this ideal for us. I hope it is delicious too. Can I use papaya? I’ve never made it with papaya, but you could sure try it! I have made it with blueberries, and I like that. I also like to add some fresh graded ginger in mine. yum. Just made this tonight for dinner and promised to save some for my husband…BUT I DONT KNOW IF I CAN. It’s soooooo tasty. Thanks for the great recipe! I just made this for my lunch tomorrow! I can not wait to eat it! I did not use the olive oil. I tasted it and it tastes amazing and it’s only minutes old! I can’t wait to have it after it’s sat all night and morning! My avocado is perfectly ripe and the red pepper adds something special to the dish! Thank you for sharing! Can you use canned tuna.? I tried this with the bell peppers, sweet onion, tomatoes, fresh parsley, avocado, canned solid white tuna in water, a little fresh dill. I used the dressing rather than the mayo recipe. I have never really enjoyed avocado, tried before in place of mayo – was not fond of it. 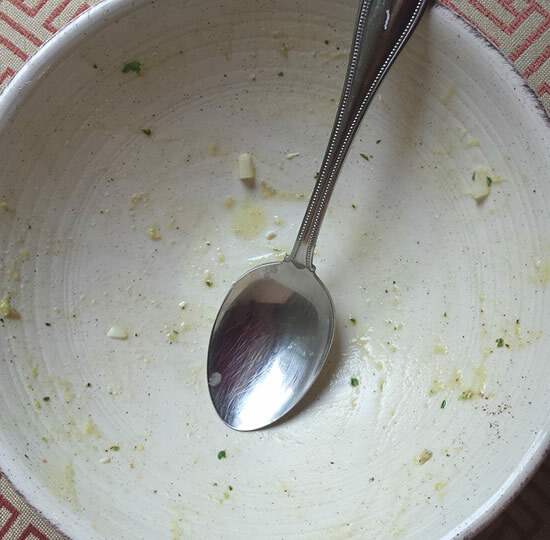 I tried it in this recipe, loved it – a healthier choice by far. I used less salt for the lemon sparks the flavor. 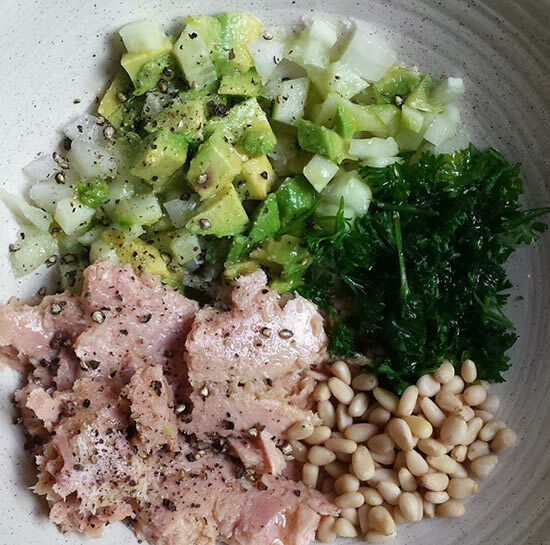 This was a delicious recipe – best ever tried with tuna. It was a little loose, I think I will mash some the avocado next time to bind some of the ingredients. Thank you for sharing this great recipe, I will share it and prepare it many times. Great! I’m so glad you like it! Thanks for letting me know. I like the combo you use with the Ranch Paleo Dressing. If I use this dressing do I still make the other dressing with the Vineagar and Olive Oil or do I use one or the other. I honestly don’t remember how I did it! I think I used both, but you could certainly cut back on the vinegar and oil. By half, maybe? I make this so seat-of-my-pants now, I just throw stuff in! Thats look amazing, But i cannot eat tuna. Can we use chicken instead of Tuna?? Sure! I think it will be best if your chicken is nice & tender. Since this has lemon juice in it, does the avocado stay pretty fresh if made the night before? I don’t know. It might, but I’ve never tried making it the night before. If I wanted to make sure it looked good, what I’d do is make up the rest of the salad the night before, then dice and add the avo just before serving. do you mix it altogether or leave it separated as pictured? I mix it together, but you can eat it however you like! This is absolutely delicious. I highly prefer this to my mayo tuna Ive been eating all my life. Thanks for a wonderful recipe to shake up my ordinary tuna! I loved this! Added a boiled egg and a modest scoop of veganaise, skipped the OO. Added capers too. Will be my go to for quick, healthy lunched. Also, looking forward to trying your homemade mayo recipe.